Last week, Richard and I worked at the farm and it was a nice change of pace to be able to cultivate semi-dry soil. I replaced about twenty dead tomato and pepper plants with others I started from seed weeks ago and set out the last eggplants, in hopes they will be strong enough to withstand flea beetle attacks. Just before (another) thunderstorm blew in, we also planted two rows of Granny’s beans. Mountain White Half-Runner might be the name most people associate with this type of bean, but I know them as “Granny’s Beans” and believe they are truly magic. I first planted Granny’s saved seeds, stored in my parents’ freezer since Granny’s death, in 1986, in 2009. 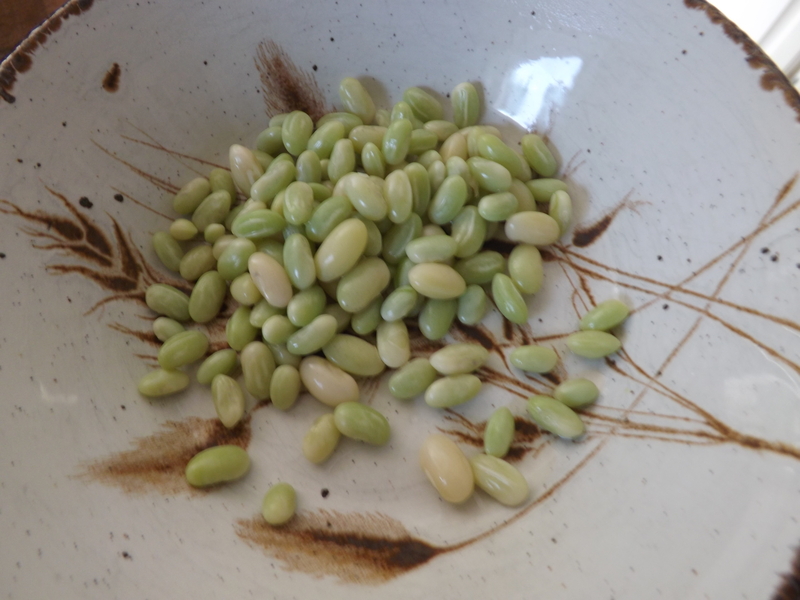 Impressed by the vigor of those plants and the huge yield, I am now a believer in the power of these special seeds and I save them every year. 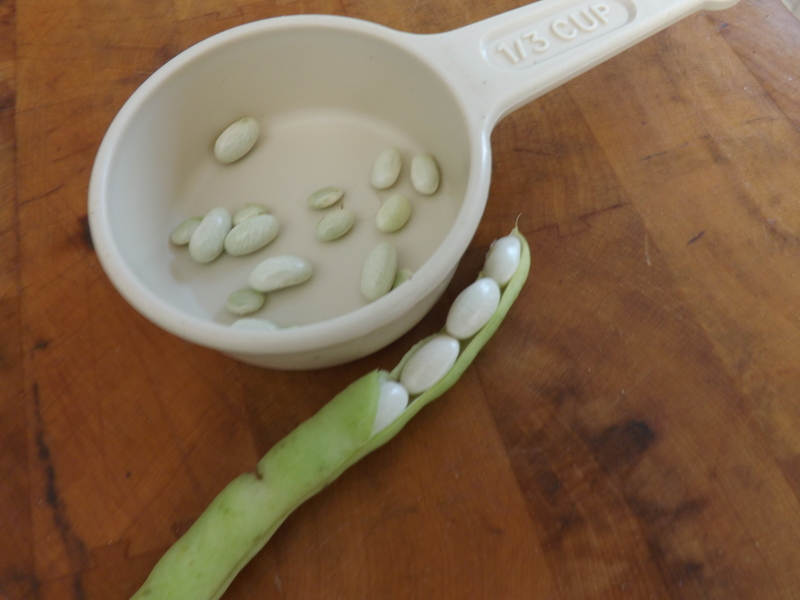 While I was picking some of Granny’s beans, planted on Good Friday, I marveled at the sweet taste of the fresh bean pod I popped into my mouth and realized these beans are as versatile as any crop that can be grown. Picked young, they are wonderful additions to salads, both raw and lightly steamed. They may be pickled, cooked as snap beans or shelled when they are mature. Although I prefer to can Granny’s Beans, they may also be frozen and the shelled beans are easy to dry for long-term storage. 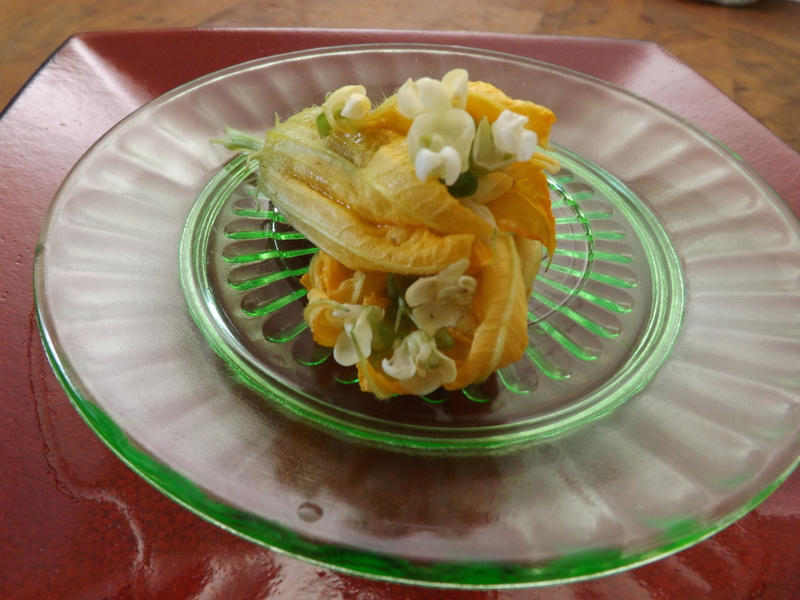 The blossoms are even delightfully tasty, not to mention beautiful! After I picked beans, I walked to another field, where Granny’s squash (also grown from her saved seeds) are growing, I was thrilled to find a small straightneck, just ready to be picked. On the same plant, several beautiful yellow blossoms were in full bloom and I plucked a few to take home. 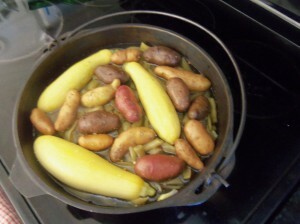 Squash and beans are a traditional Southern food combination and cooks often add summer squash and potatoes to a pot of cooked beans for a delicious, one-dish meal. Granny’s Beans, cooked in Grandmother Barlowe’s cast iron pot, are delicious when topped with fresh squash and potatoes. 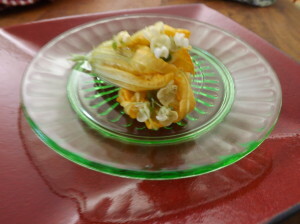 When I looked at the squash blossoms and fresh beans in my basket, I decided to try a new recipe. With a nod to that squash/bean pot dish and because I love stuffed squash blossoms, I was inspired to make hummus from the shelled fresh beans and serve it as a stuffing for the blossoms. Just before leaving the farm, I ran back to the bean row to pick a few blossoms to use as a garnish and to add even more fresh bean flavor. Usually, I “field dress” squash blossoms while I am in the garden, but since my hands were pretty dirty from the still damp soil, I removed the stamens back home in my kitchen. 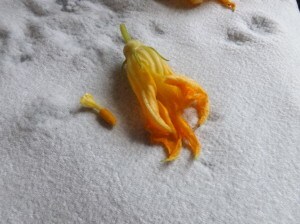 Although edible, the stamens are bitter and it is better to remove them before using squash blossoms. After the blossoms were cleaned, I put them on a paper towel while I made the hummus. Remove the stamen from the squash blossom center before stuffing. “Magic bean” hummus just might be the best hummus I ever tasted and the fresh, shelled beans were beautiful shades of green and white. If you try this recipe, use only a tiny bit of salt. After making the hummus, you can always add more, to taste, but the heat of the red pepper is really the flavor pop in this dish. Because I am just that “crazy,” I used one of the dried peppers Granny shared with my mother. (See post from April 12th) Probably close to thirty years it has been stored in the blue glass jar and still packs a punch. This dish was truly a Granny Tribute. Bon Appetit! Granny’s Beans, fresh, shelled and lightly cooked. Add a small pinch of salt (I used French Grey sea salt) to beans in a pot. Add water to cover and gently boil for about 3-5 minutes, until beans are tender. Drain water from beans and place slightly cooled beans in a blender or food processor. Add garlic, lemon juice, tahini, salt and red pepper. Blend ingredients until smooth. Add olive oil in a steady, thin stream while blender or processor is working until hummus is desired consistency. For as little waste as possible, use a plastic spatula to remove hummus. 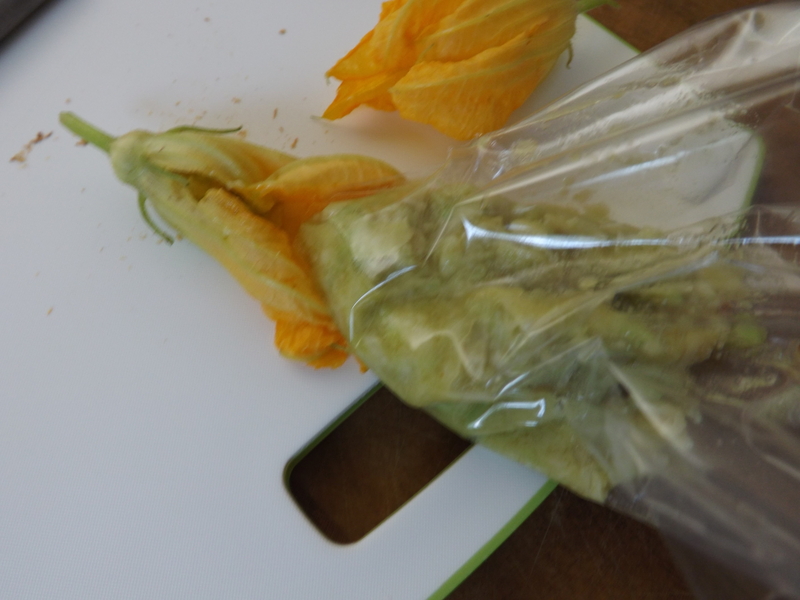 Use a plastic zip lock bag to pipe the hummus into each squash blossom. Easy to use, clean up is a breeze and there is no waste of precious ingredient. Gently clean (if necessary) four squash blossoms and remove stamens from the centers of each. This entry was posted in Heirloom Seeds on July 22, 2013 by cindybarlowe. Rain, rain, go away! This has been my daily mantra for the past few weeks. Never has our farm been so flooded for so long. The drive between fields that usually allows safe passage, even for my car, is now covered with about four inches of water that is home to thousands of mosquito larvae. “Wigglers” could be killed with a dose of insecticide, but such an application would derail our organic purpose, so Richard and I scratch nasty bites and pray for dry weather every day. It’s hard to believe how dry, in comparison, this season was last year; we actually had seven weeks without rain and had to water some plants, just to help them survive. As in all things, Nature needs a balance of important components to thrive and produce and achieving that recipe of just the right amount of sunlight, rain, warm and cool temperatures is not always possible. Of course, the incessant rain and frequent storms mean that Heart & Sole Gardens has suffered crop loss. Thankfully, not to the extent of other, industrial farms, but enough that I hope the remaining plants will produce enough fruit and vegetables that will allow me to preserve food for the winter. By the time tomato season ended last year, I had canned over ninety quarts of tomatoes and we have less than ten of those remaining. Of the twenty-eight quarts of tomato sauces I canned, only a couple are unopened. Canned tomato juice and pickled tomatoes are also depleted and, while I am thankful for all the preserved harvest we enjoyed throughout the winter and spring, I hope to replenish my shelves with this season’s tomatoes. Granny’s Beans, my maternal grandmother’s (Lora Bolick Minton) heirloom White Mountain Half-Runners, are beginning to produce well, even though I only planted a short row. Another planting has germinated and is beginning to grow, so I hope to have lots of later beans for canning. 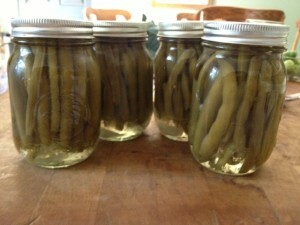 Yesterday, I canned Dilly Beans, a pickled treat my family loves. 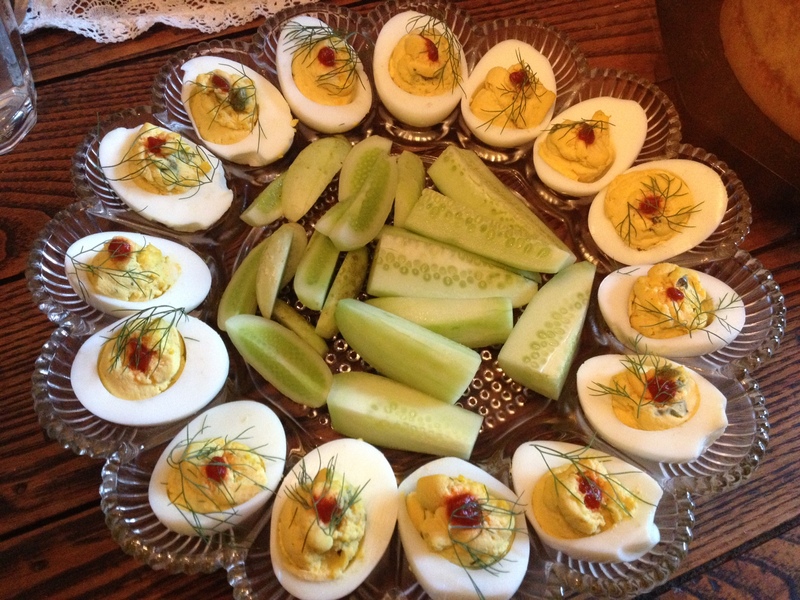 The recipe is from my husband’s maternal grandmother, Vestal Coffey Anderson, and her handwritten copy, a wedding gift to me, is a treasured gift. 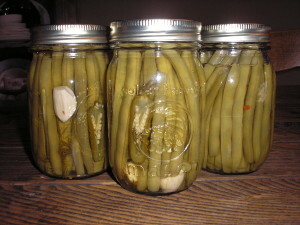 I love the recipe and, except for the salt, water, and vinegar, all ingredients packed into pint jars were grown by us. A special bonus is the dill and beans, both grown from seeds saved by Granny. This year marks the first time this particular dill seed has been grown since circa 1985! I plan to gather all the seed I can save from these special plants. 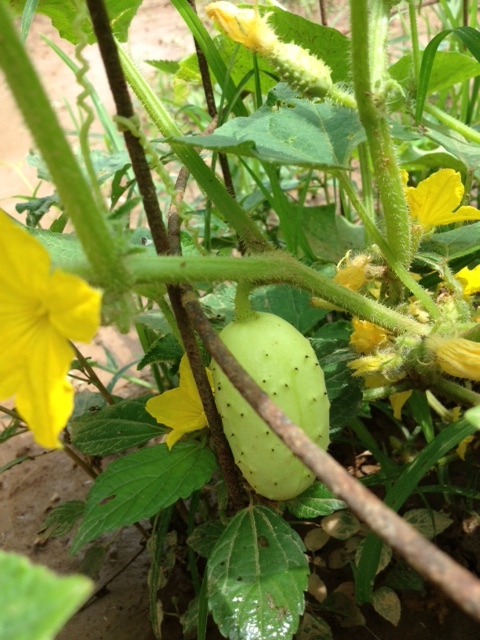 Although many plants are still struggling with mud and too much water, I am pleased to note Granny’s white cucumbers are now beginning to produce. I picked three small ones and we enjoyed them with Sunday evening’s meal. Thinly sliced, each person was able to sample some of these treats and I hope there will be many more, both for pickles and for seed saving. Gran Anderson’s famous Dilly Beans, made with Granny’s heirloom beans. Prepare a hot water bath for canning by placing a heavy-bottomed stock pot, filled with enough water to completely cover the pint jars, on a hot stovetop. Place new jar lids and rings in a small pot of hot water, place on low heat on stovetop. Gather tools for removing hot lids from water and for placing and removing jars from water bath. In a large saucepan, heat vinegar, water and salt (sugar, if used) mixture and stir until seasonings are dissolved. Allow to cool on stovetop while preparing beans. Blanch beans by cooking in boiling water for about 10 minutes, immediately drain and place beans in ice water. Beans, placed vertically, until jar is packed as tightly as possible. Be sure beans are about an inch shorter than the top of the jar. Pour brine over beans, leaving about ½ inch headspace. Carefully wipe jar rims with a clean cloth and place lids on top. Screw rings tightly to secure. Place jars in water bath and process for 10 minutes. 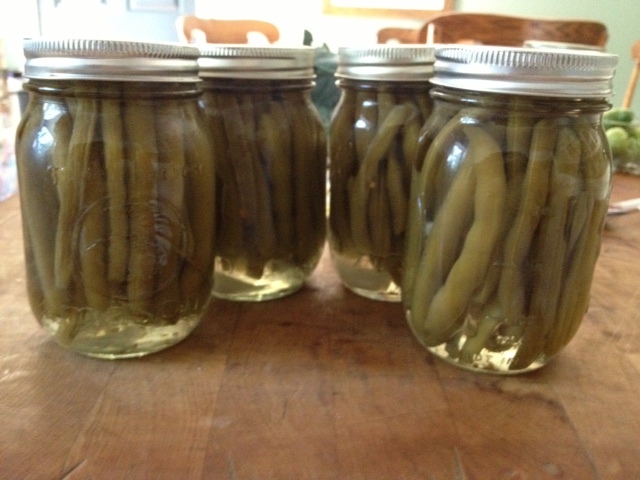 Last year, I added fresh, sliced jalapeno to these Dilly Beans for an extra kick. Hope to do so again this year when peppers are in season. This entry was posted in Heirloom Seeds on July 9, 2013 by cindybarlowe.